A new 650,000-square-foot, 17-story federal office complex makes its home at 90 Elgin Street on Crown-owned property amongst Ottawa’s national monuments and institutions. 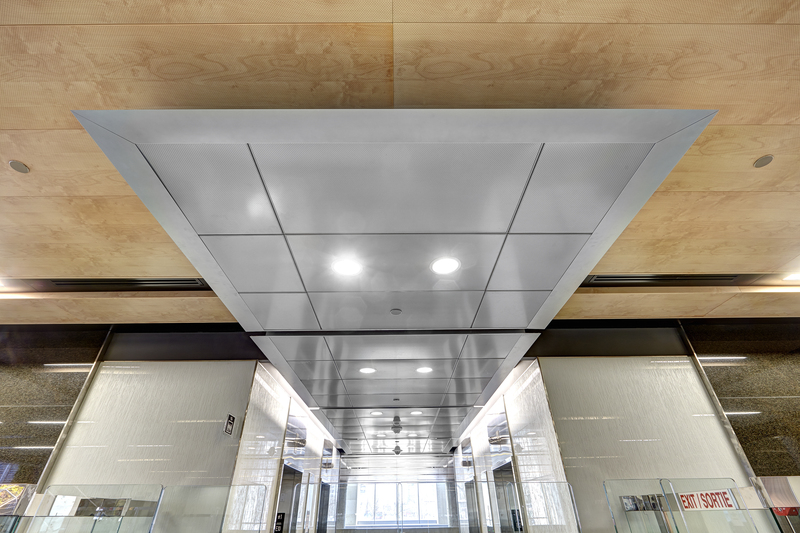 The $250 million landmark building features ROCKFON’s ceiling systems throughout its lobby and offices. In addition to helping create an attractive workplace, these ceiling systems also support requirements for comfort, including acoustics; safety, including seismic conditions; and sustainability, including LEED® Gold criteria. As the 90 Elgin Street’s development manager, GWL Realty Advisors Inc. ensured the building would be worthy of its prominent placement and national significance for the Government of Canada as the landowner and The Great-West Life Assurance Company as the building owner. Designed by the joint venture of DIALOG and David S McRobie Architects (DSMA), the building’s stature and style are consistent with other significant federal buildings surrounding Confederation Square. Delivering the desired aesthetic of wood and the performance benefits of metal, Rockfon® SpanAir™ hook-on, square edge, 10-foot, aluminum panels were painted in WoodScenes™ Lazy Maple with matching custom trim. 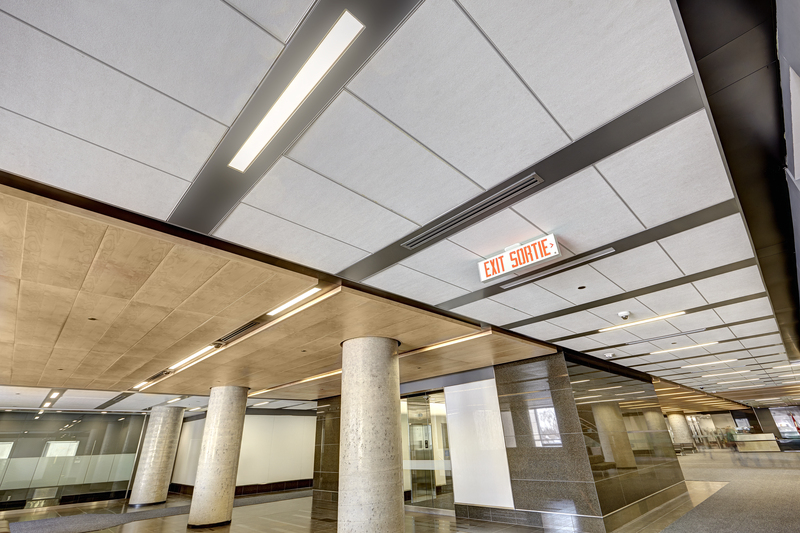 Additional mock-ups were created for the lobby’s ceiling pods and linear metal ceiling. Suspended at various planes, the rectangular ceiling pods add visual interest to the main lobby. Achieving the intended look and performance involved more than 5,300 square feet of Rockfon® Planostile™ lay-in, reveal edge, solid aluminum panels. Black, lay-in Planostile panels knit together the ceiling’s rectangular pods and the SpanAir panels. 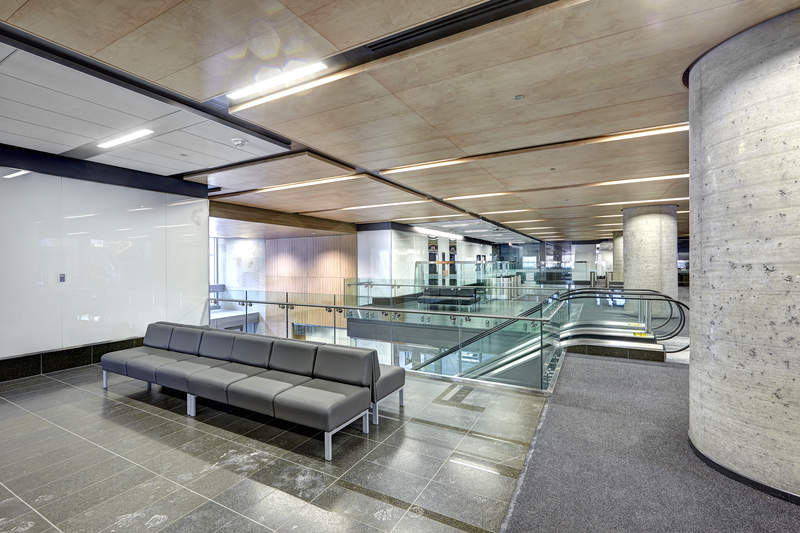 In contrast to the warm wood-look finish on the SpanAir panels, a sleek metallic Satin Silver anodize was selected for the linear metal ceiling in the lobby entrance on Elgin Street facing the National Arts Centre. To create this eight-story-tall grand welcome, Advance Drywall installed Rockfon® PlanarMacro® 8-inch-wide, square edge, open reveal panels. A similar ceiling system was used for the secondary lobby entrance on Albert Street. Satin Silver anodize also was the finish of choice on the ceiling pods positioned at the elevator bays. These pods are composed of Rockfon Chicago Metallic suspension systems, InfinityZ Razor Edge perimeter trim and Planostile lay-in metal panels. An acoustical backer and perforation on the panels offer high sound absorption, achieving a Noise Reduction Coefficient NRC of 0.90. Elsewhere in the lobby, 0.70 NRC was acceptable. Final details were presented to confirm how ROCKFON’s various ceiling systems integrated with the lighting, air diffusers, sprinklers, security systems and columns. Not only did the ceiling system need to accommodate these elements, it also needed to provide easy access to the plenum for potential repairs and updates to wires, pipes, ducts and other components. ROCKFON’s hook-on panels allow maintenance staff downward accessibility to the plenum and mechanicals, without the need of special tools. Accommodating the lights and air diffusers, the custom-sized Planostile planks were finished in both black and in Satin Silver. The Satin Silver was matched with Rockfon® Infinity™ perimeter trim for a clean, smooth edge. Beyond the numerous sizes of factory-cut panels, the large columns in the main lobby also proved challenging. In addition to the lobby, Advance Drywall Ltd. installed Chicago Metallic suspension systems in the majority of the offices. Promoting team building and enhancing workplace well-being, the offices’ interior design subscribes to the new “Government of Canada’s Workplace 2.0 Fit-up Standards.” This initiative champions the design of modern workplace to attract, retain and encourage public servants to work smarter, greener and healthier. Workplace 2.0’s goals include noise control and privacy, sustainable finishes and reduced emissions, as well as flexibility in adapting to future uses, configurations, equipment, technologies and employees. These also mesh with the Canadian Green Building Council’s LEED guidelines. “Research shows that happier, healthier employees take fewer sick days and are more productive; all of which helps save money on employee turn-over and training,” says Isabelle Champagne, CTR, ROCKFON’s architectural sales manager in Ontario. Aiding in these sustainable goals, ROCKFON’s metal ceiling suspension systems and panels contain no organic compounds that would support mold or microbial growth. Its aluminum ceiling panels contain 100 percent post-consumer recycled content and, after their useful life, can be recycled locally. 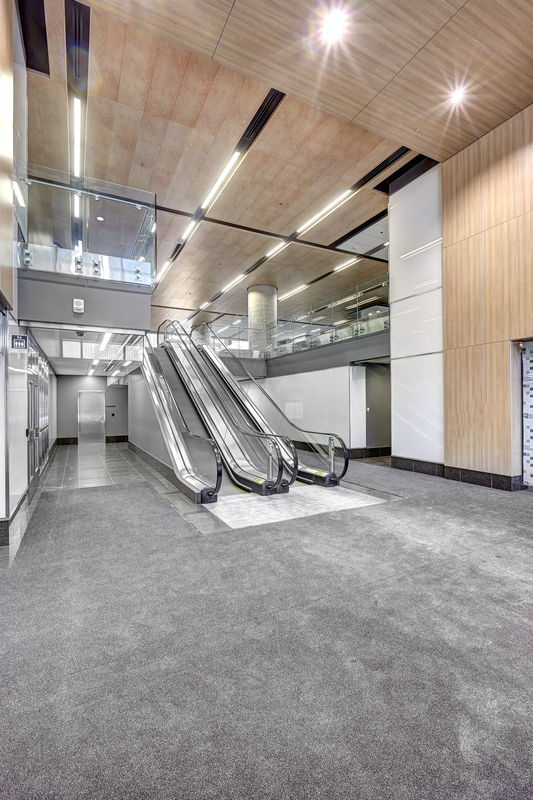 The project earned LEED Gold certification for Core and Shell, met all other required performance criteria, and was substantially completed on schedule. “At the end of the day, everybody loves the ceiling,” Tang says proudly. “It was quite an exercise in coordination and integration. In the end, it turned out very well. It’s a good balance of quality finishes for a good value,” concludes Salem. Completed in Oct. 2014, the building was named as the James Michael Flaherty Building in honor of the late finance minister and one of the longest-serving Ministers of Finance in Canada’s history. Up to 2,600 federal employees are expected in the building by May 2015.